For several months now we have been busily constructing a new set of online courses. After a lot of course writing, filming, editing, delivering, testing and tweaking we are extremely pleased to announce the release of our first two courses. Designed for complete beginners these courses are taught completely online through our new online teaching portal, The Creative Classroom. Stumpwork Embroidery allows you to add a three dimensional affect to your projects. If you enjoy creating projects that are intricate, detailed and versatile then Stumpwork is for you. 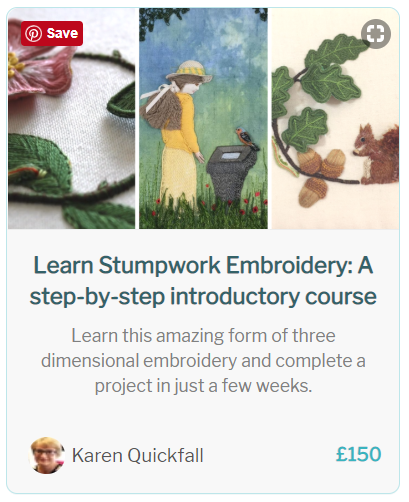 Our Stumpwork Embroidery course takes you through the basics and beyond in a step-by-step approach, showing you how to get started while introducing some of the different techniques. You’ll work through each of the lessons to complete a beautiful design with a dog rose flower and a caterpillar, which can be used on cushion covers, greeting cards, or as a beautiful wall handing. Includes over 90 minutes of video content, plus downloadable course content and handbook and hours of exercises and tasks to complete. And, to help keep you focused the lessons within the courses are made available once you’ve had time to adequately complete the previous lessons. Freeform Machine Embroidery is a great way of learning how to use your machine to create your own expressive designs. 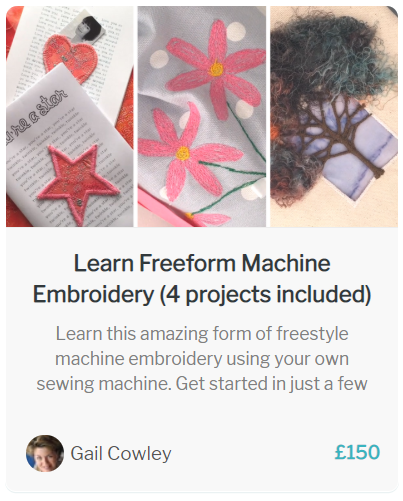 In this course we take you through the basics, including how to correctly set up your machine and how to practise various freeform techniques, such as writing your name and drawing with your machine. 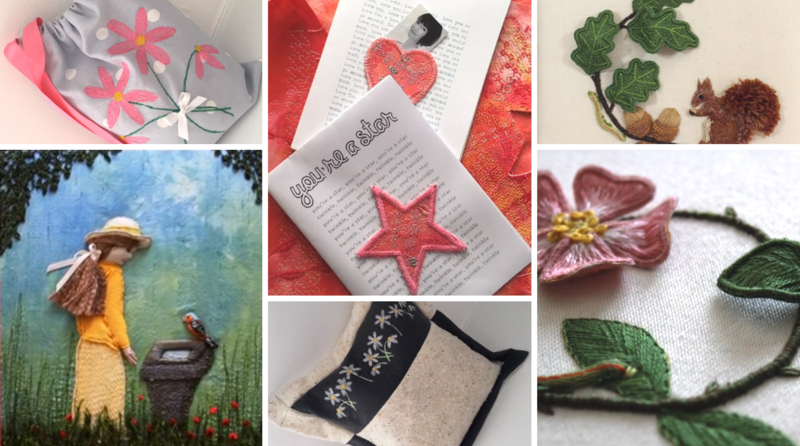 There are 4 projects included with the course and for each you can download the templates to create greeting cards, a drawstring bag, a cushion and an embroidered tree. The course is taught over a series of 7 different lessons and contains over 60 minutes of video content and downloadable templates. 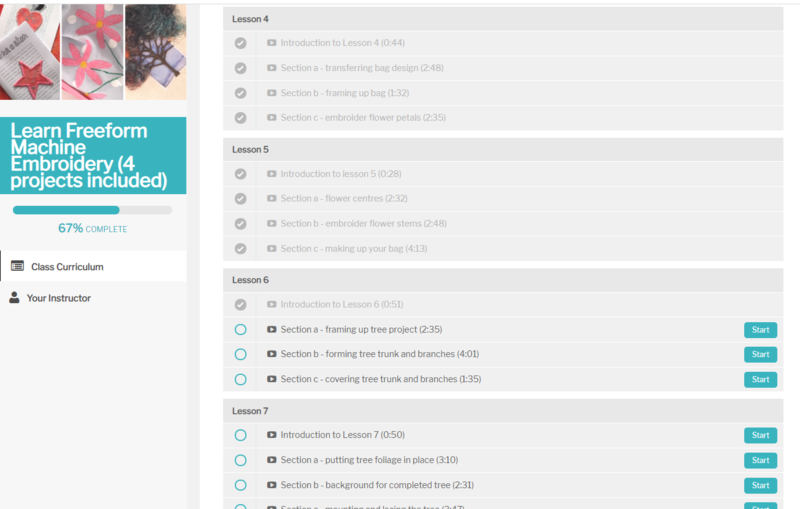 You can revisit the courses at any time and re-watch particular lessons allowing you to practice exercises before finishing projects. Because these courses are delivered through video content we have established a separate platform away from our more advanced accredited courses. The Creative Classroom will, over time, become an essential hub full of useful resources to support your creative learning as well as your personal and professional development. The platform itself allows students to keep track of progress, access purchased courses, download content,l and work their way through courses, marking lessons as ‘complete’ as they go along. If you need any help during the course you can contact a tutor through the platform or leave a comment for a reply from one of our tutors. With our courses you can now learn a new craft with confidence. They also act as a great taster of our more advanced and lengthier accredited courses. So go on, buy a course today or gift a course by purchasing a voucher. We look forward to seeing you in the Creative Classroom and helping you begin your creative journey.